L'article a été vendu.Cet article a été vendu pour CHF 3'526.00. 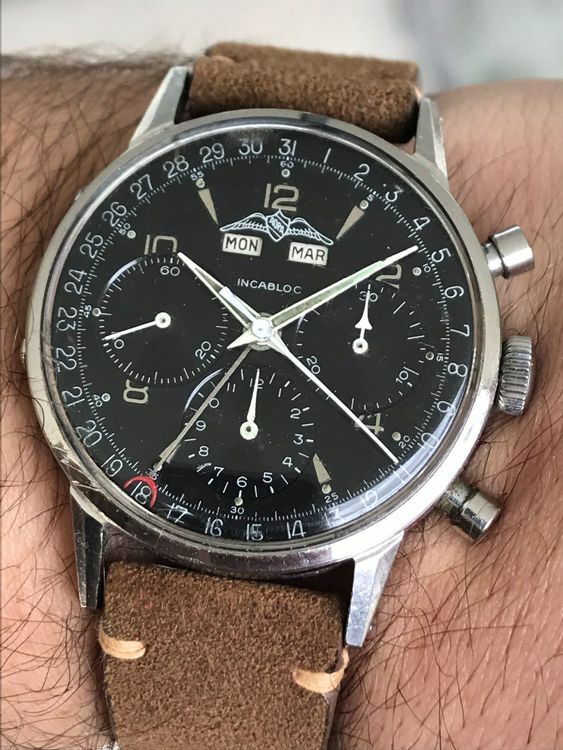 Rare 1955 WAKMANN AOPA Chronograph 72C! Super Rare Wakmann FRANCE! 38mm! Black Glossy Dial! Top 72c! Very nice and all original vintage 1955 WAKMANN AOPA mens triple date chronograph watch with calibre 72c! The watch is unpolished with a massive stainless steel case of 38mm diameter and with screw back. Super nice and great condition for a vintage 50s watch. Please refer to clear pictures. Really top condition! Running perfectly and keeping accurate time. All functions work as they should. Manual-winding chronograph movement calibre Valjoux 72c with full calendar, signed wakmann. Stuning original black glossy dial with luminous indexes and luminous hands! Dial has FRANCE at 6 O’clock! Comes on a new brown suede leather strap from NOSTIME Seoul. The watch is guaranteed original and authentic WAKMANN swiss made product.